Rt. 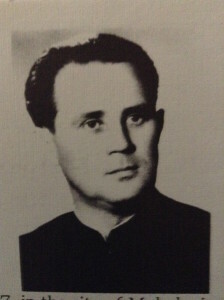 Reverend Archpriest Vitaly P. Kowalenko, 1907-1984. He served St. Michael’s 1967-1979. Father Kowalenko was born on December 7, 1907, in the city of Mykolayiv, Ukraine, which is on the river Boh. There are two cities by that name. The other is in Galicia. As a young boy of three years of age, Father Kowalenko started to show a keen interest in participating in church services. His favorite past-time was pretending to be a priest. His doting grandfather made him a “kadylo” and “stichera” and he would walk the house chanting and reciting prayers. At the age of 5 he began serving as an acolyte and many times he missed school only to be found in the local church. In 1921, at the age of 14, he participated in the historic First Sober of the Ukrainian Autocephalous Orthodox Church in Kiev, being at that time a sub-deacon to the Great Metropolitan Wasyl Lypiwsky who had the courage to declare independence of the Ukrainian Orthodox Church from Moscow. In later years this proved to be a disastrous moment to all adherents of the U.A.O.C. [due to the terrible persecution of the Church by the Soviet government -ed.]. The outbreak of World War II and the ensuing chaos were his salvation. In May of 1942 Father was ordained [probably to the diaconate -ed.] in the Church of St. Andrew Pervozvany in Kiev. His Spiritual Father was Metropolitan Nikanor. Because of my husband’s extremely active involvement in the revival of the Church the Bishops gave him the nickname “Vseukrainsky” [all-Ukrainian -ed.] and the rank of Arch-deacon. In 1949 the late Metropolitan John brought my husband to the United States. I did not come at that time. In 1952 Father was ordained as a Priest by Metropolitan John in Philadelphia, PA.
Father did missionary work in Cleveland, Ohio and then was the pastor of church in Millville, PA, Minersville, PA, Coatesville, PA and in Woonsocket, RI. He died in Pomona, NJ on May 9, 1984. Father’s biography, documented by newspaper clippings, letters and the minutes of the Sobers of the Ukrainian Autocephalous Orthodox Church – Europe 1942-1949 is going to be published in Canada in the near future.